Marilina provided a great tour of Crete for we three men. From initial contact through the end of the tour her communications were timely. Her knowledge of Crete history, mythology and the island was thorough. She welcomed questions and her responses were thorough. She not only took us to historic sites to view the site but also told the story about the site that made the tour especially interesting and exciting. Marilina is personable and was a pleasure to be with throughout the 3 days. Always on time. This tour was amazing and I highly recommend it, both because of the fascinating content and well as the knowledge and personality of our guide, Marilina. She was able to provide context and vivid descriptions of Knossos Palace, making the site much more manageable and enjoyable. Afterwards, Marilina took us around Heraklion and again gave us a lot of historical context for the city's great monuments. The best part of the tour was Marilina herself, who was wonderful. I cannot recommend this tour enough! Marilina is knowledgeable and also very much fun! Her English is perfect, so it's easy to understand her. We are very pleased with our tour of Knossos Palace, museum, and Heraklion city with Marilina. She explained in detail about the palace discovery, showed us all the unique and fascinated features of the menoian civilization in the museum, and went through the important cites of the city. The tour was interesting and full of new information. We highly recommended this tour with Marilina. remarkably knowledgeable - excellent tour! highly recommend ms paters. Marilina did a good job explaining the history and structural engineering design of Knossos Palace. I loved that she explained the Minoan mythology, after walking the palace grounds, and the Athenian Battle. It was enlightening, helping us comprehend the labyrinth, and how intelligent the Minoan Civilization was for their time period. She further did a good job explaining the historic neo-classical structure designs in the town of Heraklion. Awesome tour...Marilina is very knowledgeable. Knows her history well! Marilina has been a tour guide for 20 years and really knows Crete. Licensed so entry into palace and museum no problem. Works with taxi driver that owns his Mercedes taxi, very professional and fun. Best get to get out, see sites and get picked up. Marilina from Crete and very personable. We spent a day and half and enjoyed our tour. Marilina was an excellent guide who gave us a great tour of the Knossos palace, she was engaging with our kids(10 & 5) very well, as well us us. We spent about 4.5 hours with her, first touring the Knossos palace, followed by a small tour of the town of Heraklion. She recommended a great restaurant for lunch. I would highly recommend using her as a guide when you are visiting the Knossos palace in Crete. Excellent tour guide. Very knowledgeable and friendly. English is excellent would highly recommend especially for anyone traveling from U.S. I'd like to give our tour of Knossos and Heraklion the highest rating, 5 out of 5. Our tour guide, Marilina P, did an exceptional job. She combines historical and artistic expertise with an obvious love of her subject matter. We gained a deep appreciation of Cretan culture and we had a wonderful time. Thanks, Marilina! Fun tour, fun guide, we would definitely use Marilina again. Marilina was fantastic! So friendly and knowledgeable. An unforgettable experience! Marilina was really lovely! We enjoyed her energy and her knowledge esp her folder with the pictures. It was a super hot day and rather challenging but Marilina kept it concise and we appreciated her flexibility. The coffee and cake was a godsend as was her company. Thank you from the Carroll family. Thank you Marilina, We enjoyed our tour of Knossos. We learned a great deal and you made us feel welcome at a very popular site. You really made the Ancient Minoan World come alive. The tips you gave me for the rest of Crete were also excellent. I went everywhere you suggested while the girls stayed at the beach. Marilina was incredibly knowledgable, flexible, and engaging. We had an amazing tour of the city center in Heraklion and of the Palace of Knossos. My kids of seven and nine, English speakers, were engaged and had no trouble following the stories and histories. I can't recommend Marilina enough. Excellent guide. Personable, knowledgeable, engaging. More than all one could ask for in a tour guide. You people are lucky to have her associated with your organization. Guide wisely started at the museum to help us understand the civilization involved then showed good sensitivity to our physical limitations while touring the architectural site. My guide was excellent , I could not have wished for a better one. I have had many in the past in other countries, but none were as knowledgable and considerate. Marilina was very friendly and chatty making for a very enjoyable day. She answered many of my questions. One problem I have found in the past with guides is that they can be too academic almost trying to impress you and make out that their country is vastly superior to your own! I never felt this with this guide. We got along very well. Marilina provided us with the best guiding experience we have had, and we have had several private and group tours in Europe, Asia and The Americas. Her preparation in studying aspects and precise details of our specified WWII interests was quite exceptional and matched only by her presentation and enthusiasm. Marilina has considerable knowledge of Crete's history, both ancient and recent. Her pride in being Cretan shows through. Her professionalism and organization makes for a memorable tour. Marilina is the best guide we could imagine. Her depth of knowledge is considerable. She is articulate, and her English is impeccable. We learned a great deal from her today. We can't say enough good things about our experience with her in Knosos and in Assites. George our driver is skilled and transported us quickly and safely. Amazing tour, from start to finish. Highly recommended ! Marilina was an aercheolgist expert when it came to the KNOSSIS. Very articulate and knowledgable. Music portion was above our level but fun. Shpping in the Agora is a must. Marilina is a sweet person and fabulous guide. Can tell she really enjoys her work. Found her to be a natural teacher with so much knowledge. She's both organized and clear as she delves into Minoan history, myth and art. Marilina has an uncanny ability to show how these 3 aspects of Minoan culture make the Minoan people who they are today. She make's the Minoans come to life. Can't wait to go back to Crete to take her Minoan folklore tour. Had such fun both learning and laughing with Marilina. This fabulous tour is exactly why we use ToursbyLocals. Marlinna took us to places tourists don't normally get to visit. We went to the traditional Creton village of Assites where we learned about ancient jobs of basket weaving, sheep bell making, wine/cheese/honey production, etc. Lunch in a local's home was the highlight. Marlinna is extremely knowledgeable and friendly! We had a really great day with Marilina. She was very personable, extremely knowledgable, and her English was perfect. TOUR GUIDE RESPONSE: Thank you very much for your feedback Mr Diamond! I am very glad that you enjoyed the day. It was a great pleasure meeting you all and sharing with you! We panicked when we heard our ship was changing days in two ports due to a storm. I had to contact management & arrange for a new guide since our original guide was booked for the new day. They arranged for Marilina and she was just delightful. She is so knowledgeable about Crete & gave us a wonderful tour from Chania to Knossos. She even had to drive 3 hours to get there early in am so we much appreciated it. Her English is flawless and she was able to adjust to our requests for a custom tour. 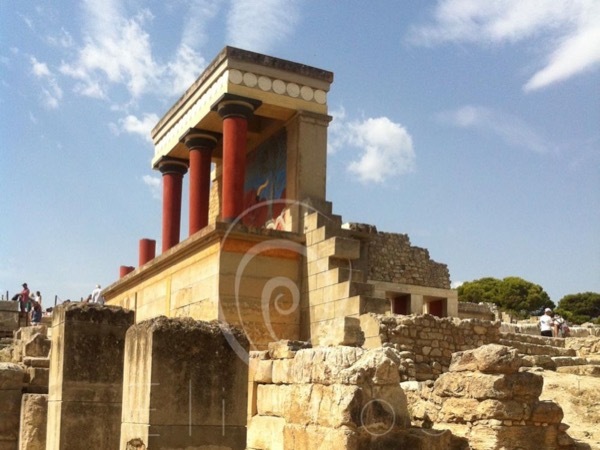 We spent an incredibly day with marilina exploring Knossos and Heraklion. We also received a private music history lesson that she arranged. The highlight of the day was certainly the palace of Knossos. Marilina was a great teacher and guide. It was a crowded and hot day, but marilina managed to find shade and ways to skip the long queues which kept our tour moving. Marilina was totally flexible and gracious. It was an amazing day and I can't recommend her more highly. What can I say, Marilina was great. Articulate, knowledgeable and her english was excellent. I would recommend her to anyone looking for an informative and personal experience. Worth every penny. I have used Tours by locals on my trips for yrs. now, and I really can't say I've ever had a bad experience. Marilina was our tour guide in Crete. We had a most enjoyable day with her! Marilina is so well informed about the culture, the history and her passion for the Minoan history especially palpable. She even engaged a young 16 year old with her knowledge and engaging stories. We would highly recommend her and will contact her again our next time in Crete. She is warm, personal and very knowledgable, a winning combination for a tour guide! She is superb!!! Very knowledgable and energetic. We had a great time. Wonderful guide to visit Crete with. Marilina was very knowledgeable, engaging and fun company. We had a great time. Marilina was engaging, knowledgeable and fun to be with. You can't go wrong touring with Marilina! Marilina did a fantastic job of sharing her island's history with us. She wove the ancient history into what we were seeing today in a most interesting way. A highlight was a visit to the Arkadi Monastery where her Great Grandfather sacrificed his life for freedom. It was very moving for us all. Some of our group wanted to shop while some wanted to see the Museum, and Marilina did a great job of seeing to it that everyone had the experience they most wanted. Marilina was a great guide, very nice and providing invaluable information about history of Crete and current situation of the island. The visit of the Knossos palace was particularly interesting. Perfect English as well so no communication problem. I highly recommend Marilina and this tour. Marilina helped me organise a last minute tour for my boss & his friends of Knossos Palace & Heraklion. She was an absolute pleasure to deal with and was very accommodating on timings for the group. She also organised a mini bus for them to use on tour & for the rest of the day and while I hadn't used Tours by Locals before, I would certainly recommend as an easy to use and professional service. Thanks again Marilina, the boys really enjoyed the tour & you helped me immensely.